SOX 404 Audit; we are ready when you are! The professionals at Lazarus Alliance Compliance, LLC are completely committed to you and your business’ SOX 404 audit success. Regardless of whether you represent the private sector or the public sector, we stand ready to partner with your organizations. Our competition may want to keep you and your employees in the dark where security, risk, privacy and governance are concerned hoping to conceal their methodology and expertise. We don’t prescribe to that philosophy. We believe the best approach is transparent and built on a partnership developed on trust and credibility. Lazarus Alliance Compliance, LLC’s primary purpose is to help organizations attain, maintain, and demonstrate compliance and information security excellence – in any jurisdiction. Lazarus Alliance Compliance, LLC specializes in IT security, risk, privacy, governance, cyberspace law and SOX 404 audit compliance leadership solutions and is fully dedicated to global success in these disciplines. We can help your organization too! Our client’s come from all business sectors across the world. Lazarus Alliance Compliance, LLC’s SOX 404 audit process initially takes just a few weeks from start to completion to baseline your organization depending on your team’s availability. We are cognizant that our clients have full time, everyday obligations in addition to dealing with auditors so we are flexible to your needs and work around your schedule to provide a quality audit and report in the time frame you desire. Provide you with direct access to obtain immediate responses from Lazarus Alliance Compliance, LLC professionals regarding the impact potential changes to services or controls may have on the upcoming audit. Ensure that you will have access to obtain immediate responses from Lazarus Alliance Compliance, LLC professionals regarding the impact potential changes to services or controls may have on the upcoming audit. A significant differentiator you will immediately appreciate is our Proactive Cyber Security™ SOX audit methodology which take a continuous audit approach rather than the end of reporting period Audit Anarchy approach by other firms. We will also utilize our proprietary IT Audit Machine technology to set you up for success. The IT Audit Machine is a full-featured and highly collaborative assessment and reporting tool only available from Lazarus Alliance Compliance, LLC and Continuum GRC. Lazarus Alliance Compliance, LLC creates sustainable Sarbanes Oxley (SOX) audit partnerships with our clients. We have a proven methodology and project plan that helps our clients achieve compliance on budget and on schedule. You will come to appreciate our Service, Integrity and Reliability which will be apparent to you from the very first call. 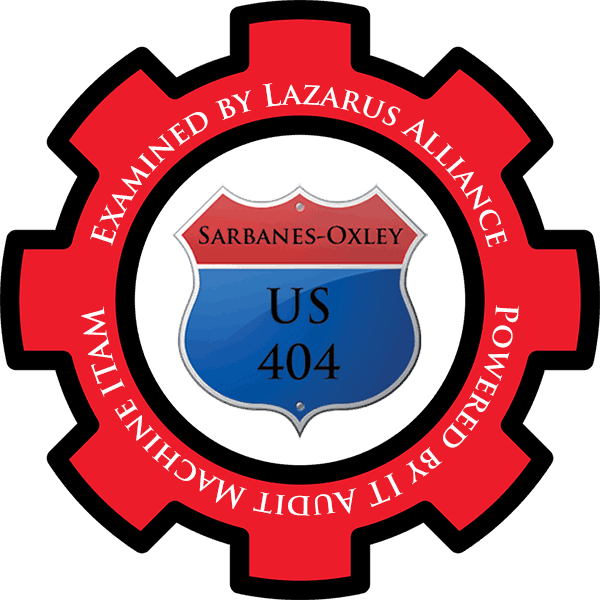 The Lazarus Alliance Compliance, LLC Sarbanes Oxley 404 audit assessment will be conducted utilizing the current Sarbanes Oxley 404 audit standards outlined in the COSO framework in coordination with your external public accounting representation so you will be completely current with the industry standard specified by the PCAOB. Leveraging the Continuum GRC IT Audit Machine, Security Trifecta methodology and the Policy Machine, Lazarus Alliance provides international standards that are recognized as “Best Practices” for developing organizational security standards and controls that support SOX 404 audit certifications. We want to be your partner and SOX 404 audit assessor of choice! For additional information please contact us using the form to the right or calling 1-888-896-7580.